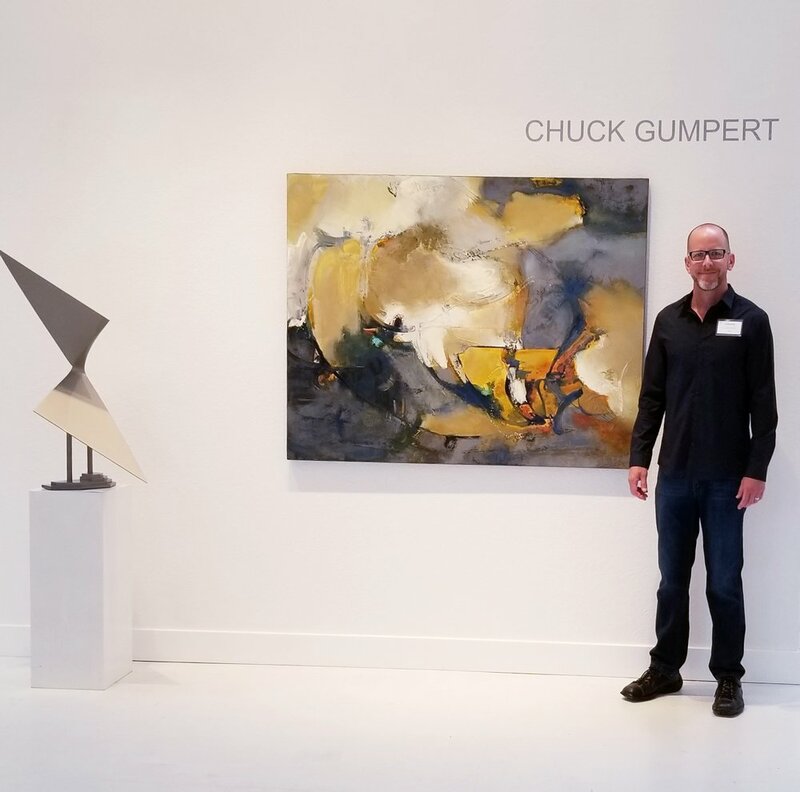 In June/July, 2018, Gallery 903 featured abstract artist Chuck Gumpert. His mixed media abstract works capture color and light. 903: Tell us about your process. How has it changed over the years? CG: I came from a graphic design and photo-collage background, so I think my paintings have always been about striving to achieve the vibrant glow and lush translucency of a digital image on a screen. I work in layers, and often bounce between several canvases at once. I pride myself in the fact that I’m not confined by formula or habit, but have created a body of work that shares a common thread and communicates. 903: Much of your work has personal themes. How does real life shape your work? CG: The bold, colorful, and energetic nature of my abstract work is indeed an expression of my inner self. It’s not always apparent what I subconsciously tapped into in the moments of creation of any one piece. Each new painting is a culmination of forty-plus years of experiences, emotions and observations — and a further exploration into my imagination, my memory and my heart. 903: All of your work is mixed media. What mediums do you use? Do you use them all in each painting? CG: In addition to acrylic and oil paints, I’ve always been experimental in employing a variety of media and techniques to achieve that “digital” light. I don’t always use every medium in each painting, each piece progresses very organically. In recent years, I’ve enjoyed pushing even further — adding new textures and collage elements. I’ve recently studied screen printing, and hope to figure out how to include screened imagery in my abstraction. 903: You clearly love color. How do you choose your palettes? CG: I begin most paintings with a “digital study” — which can be anything from a photo of something in nature, to a figure, to a detail shot of a particularly yummy section of one of my own paintings. I coerce that imagery digitally to create a pleasing abstract composition and palette as a starting point, and then re-interpret that on the canvas. The color mixing often happens very much on the fly, again striving to avoid the formulaic — sometimes departing dramatically from the digital study!